Here at Aspire we recognise that everyone is an individual who requires a bespoke personal training programme to achieve their goals. When enrolling in personal training you will benefit from dedicated one-to-one sessions, creating a unique specific and dynamic training programme with a trainer that will have all the right skill sets to match your specific goals. We conduct an initial screening and consultation which will allow us to assess all elements off fitness and allow us to really establish what you want to achieve from your training. This screening will help us to create a regime specifically tailored for you, taking into account current fitness, potential injuries, limitations and nutrition. You will then be guided through an entire programme of health and fitness development, which includes your training inside and outside the gym, your diet and your lifestyle. We encourage you to exchange all contact details so you have unlimited access to your trainer this way you have continual access to your trainers advise through social media email and phone. Personal training at Aspire doesn’t limit itself to any one type of training and has trainers equipped with a vast amount of knowledge in different areas and a wide range of disciplines. This allows us to keep training method that not only challenge the body but mind as well. Training options can involve options such as strength, mobility and stretching sessions, cardiovascular exercise and sports performance. We have various options and you can purchase single sessions, sign up to bulk discounts or packages. While we would recommend committing to two to three sessions a week to see the maximum benefit from the personal training experience, we remain realistic about how finances and day-to-day demands can impact this. Therefore, if you are only able to commit to 1 session a week/fortnight it’s not a problem our trainers will advise you of the appropriate exercise to continue with while training by yourself. Designed to be progressive and challenging, the plan will take you through a range of fitness elements, making sure that you are not just leaner, but also stronger, flexible and agile. Make the commitment and we guarantee results. A fundamental part of the personal training service is the initial consultation. It serves to build a complete physical and mental picture of you. This is another crucial stage of the consultation process if you don’t know where you want to be how are you going to get there? Together we establish exactly what it is you want to achieve and then we set realistic, attainable targets to meet within an agreed time period. We put together an action plan of how we are going to achieve these goals and set about designing the rest of the package. Lifestyle is another important factor that has an impact upon your results. Having an understanding of your routine and other commitments allows us to realistically plan for a programme that will work for you. Your lifestyle can compromise many things including your sleep patterns, stress levels, mental approach and attitude towards life – be it positive, negative, creative and or destructive. This is a hugely effective tool that has a major impact upon your results and is another crucial part of the personal training process. Static screening allows us to gather quantitative information to use as a reference point for future progress. We also use three basic tests to measure upper body lower body and core muscular endurance which to highlight any areas that may need special attention and give us a comparison point for future re testing. This is usually most relevant for people looking to build muscle or improve their strength or power output. We cover the major movement patterns that form part of a muscle building or strength training programme. This allows us to calculate the relevant loads in your programme based on percentage of max and submaximal performance. A functional movement screen shows us how your body moves relative to an anatomical ideal. We cover all major movement patterns and this gives us some additional information we need to put a corrective element into your training programme. With the relevant corrective work we can move you closer towards an ideal movement pattern so decreasing your risk of injury and improving your level of performance. Ultimately a higher level of performance allows for greater training results. These elements all combined now allow us to set the days, times, type and duration of your training. Our personal training programme truly is bespoke and will deliver time efficient and effective results. On requirement our physiotherapist will spend time analysing the mobility of your body and assess any limitations that may cause potential future problems. You will also be able to discuss any previous or current injuries which may be of concern to your programme development. This part of the process is optional and may not always be needed. During this part of the consultation you will be analysed on your posture and movement patterns which may enable any limitations. The information is discussed in detail with your Trainer to enable them to develop your programme to cope with any problems that might exist and work to rectify any conditions that may respond well to exercise. We will be looking for muscle imbalances, which can create notable disruption to form during exercise and effect movement as well as put you at risk to possible injury. By detecting such imbalances we can advise on changes to daily routines as well as assisting in personalising your fitness programme to decrease the risk of injury and optimise movement. Any recommendations for further Physiotherapy work in conjunction with your training will be made to you by the physiotherapist, allowing us to fully integrate all areas of your physical development and care. The first thing you’ll be asked to do is complete diet diary covering two days in the week and the two days of the weekend. This needs to be done in detail. It will be an opportunity to discover more about the positive and negative aspects of your diet, and to be guided through a process of dietary change. Whether your goal is weight gain, weight loss, or weight maintenance, or simply if you just want to feel more energy and improve your digestion, you will be guided through the changes that you may require. With all of the information that is gathered, your trainer is able to formulate a clear plan for your health and fitness development. You will be re-tested every 4-6 weeks in most cases and your trainer will be working towards reaching set goals on these testing dates. The programme of exercise and lifestyle change that we take every client through is one that is thorough, goal driven, successful and highly motivational. Our team have knowledge in all areas of fitness and will be able to guide you through all aspects of the following areas of expertise. However, during your consultation we will decide together if there is a specific trainer that will suit your goals and if there is a particular trainer that you will benefit more from having. This type of training involves targeting a large cross section of muscle. By using scientifically proven formulas and training methods we create maximal tissue breakdown during the training session. This breakdown is what gives the muscle opportunity to grow but the growth phase occurs after the session, the laying down of new muscle tissue is optimised with an individually tailored nutritional plan. Over a sustained training period during which the training and nutritional elements are continually monitored and adjusted where needed lean tissue gains are made resulting in a more muscular athletic physique. A range of factors need to be accounted for when it comes to loosing body fat such your sleep patterns, stress management, lifestyle choices, hormonal profile, nutrition and training. Our trainers maximise the ability to promote fat loss by taking all these elements into account and set the appropriate training and nutritional programming as well as being there to provide unlimited mental and physiological support. Each sport and athletes within a sport have very specific needs and they can be established by breaking down factors unique to them. Movement patterns, tempos, volumes and loads are all factors that need to be considered. Scientific overload, adaption and progression ensures a better prepared athlete and using these principles we create a very specific training plan based on the individual requirements of that Athlete. The training plan has to be constructed and timetabled in accordance to the athlete’s requirements enabling them to reach peak condition and performance for a given time of year. Our toning and sculpting plans combine a programme designed to progressively reduce body fat %, whilst maintaining lean muscle tissue with the nutritional support required to achieve a leaner and toned figure. Where very specific weight category or weight target are a concern we recommend nutrition plans that are calorie controlled to hit these targets. The physical training focuses on maximising the visual definition effects of the muscle group and specific target areas. Bad posture can be the cause of so many pains, injuries and ongoing complaints. Good posture is about achieving correct length/tension and relationships between muscle groups. As a rule opposite muscle groups should be balanced to have a good posture. However, if one group become overactive, tight or weak it can cause an imbalance and create poor posture. Flexibility determines the quality of your movement patterns and balance of flexibility within groups of muscles. Within the functional movement screening done within the consultation we see how these muscle groups work together and which particular muscles need lengthening or sometimes shortening. This will link closely to postural development work. We can use specialist techniques such as PNF stretches, plus more traditional forms such as static or dynamic stretches as well introducing foam rolling to help improve the condition within the muscles. By accurate assessment, including measurement of lumbar and thoracic curvature, pelvic tilts and torsions plus body alinement assessment, we know which areas of the body need to be targeted with either focused stretching or corrective strengthening exercises. An area that not many would realise becomes part of the personal training package but listening or having someone to listen to your doubts, fears, goals and reasoning is a part of the service. All our trainers have been taught how to help clients to organise, reorganise and implement changes to set them on a path to improved well-being. Whether we are listening to the day to day stresses of life or more specifics regarding the training and nutritional elements we are there to tune into your needs and be a complete support network for you. Ensuring we offer the best advice means you are more likely to make improvements to behaviour patterns and ensure results are achieved both physically and mentally. Cardiovascular fitness involves improving how well our heart and lungs work and function in delivering oxygen to the rest of the body. Commonly your cardiovascular fitness is what defines your overall fitness levels. Struggling for breath playing with the kids or walking up a hill can be a sign that your cardiovascular fitness may need some attention. Our trainers use the science behind cardiovascular training and apply its relevance to set your goals. There are different form of improving this element of fitness. However, unless the training goal specifically requires it our methods for improving cardiovascular fitness usually involve variable heart rate intervals and will be the focus of most cardiovascular sessions, this approach is proven to work and will get results fast. During and after pregnancy the female form undergoes a whole host of physical changes. Hormone levels alter, joint integrity is compromised, blood pressure changes, some muscle groups may be forced into a separated position and all of these need to be considered when training. Each trimester presents different challenges and this is reflected in your tailored programme. After pregnancy there are similar alterations that need to be addressed to bring your body back to it pre pregnancy form. We have access to a fully qualified pre and postnatal specialist who can give you all the guidance required to guide you through your pregnancy and support you in your return to fitness after. Aspire recognises that there is more than one goal to training and depending what that goal is will have a big influence on the nutritional path you’ll need to take. For example a person wanting to gain strength and put on size will need a different diet to someone who wants to lose weight or improve their fitness levels. The following nutritional information forms the basis of what good diet and meal plans should consist of. We adopt this approach as it follows the guidelines recommended by the NHS as well as other large health organisations. The information is heavily researched and is tried and tested. Depending on your goal you may need to adapt areas of this to suit your style and type of training in order to fuel your body adequately, however the basis of the nutritional advice will always follow the same guidelines. Food groups and types will remain consistent throughout all our nutritional programmes. The food pyramid is standardised diagram used to illustrate where different elements of your nutrition should come from and the quantities you should be looking to consume. This will form the base of all our recommended diet plans. Aspire adopts the eat well plate as recognised with the National Health Service. 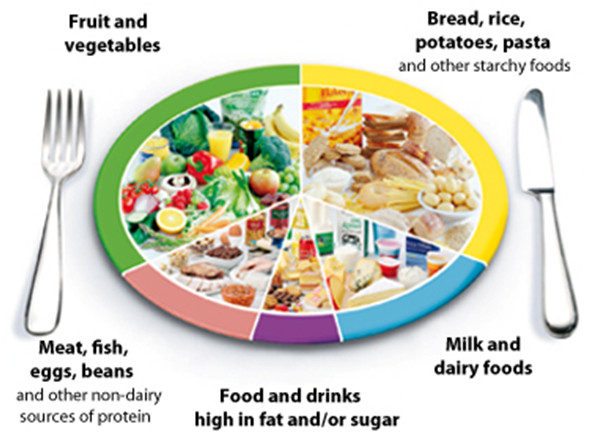 The eat well plate highlights the different types of food that make up our diet, and shows the proportions we should eat them in to have a well-balanced and healthy diet. It’s a good idea to try to get this balance right every day, but you don’t need to do it at every meal. And you might find it easier to get the balance right over a longer period, say a week. Eating healthily is about eating the right amount of food for your energy needs, and always try to choose options that are lower in salt when you can. In England, most adults are either overweight or obese. This means many of us are eating more than we need, and should eat and drink fewer calories to lose weight. Plenty of bread, rice, potatoes, pasta and cereals – going for the wholegrain varieties whenever you can. Some milk, cheese and yoghurt. Some meat, poultry, eggs, beans and nuts. And a very small amount or no food and drinks high in fat, sugar and salt. If you eat a varied and balanced diet, then there is normally no need to take any food supplements – you’ll get everything you need from your food. There are a couple of exceptions to this rule and one exception to this is folic acid. All women of child-bearing age who could become pregnant should take a supplement of folic acid each day (to be advised by her GP). If a woman does become pregnant, she should continue to take the supplement during the first twelve weeks of pregnancy. The other exception would be when it comes to training for substantial muscle gain and increase in strength. The protein requirements in this instance are so high that a protein supplement is of high recommendation to reach the required levels need to adequately repair the muscle tissues after training. When we advise people on nutrition it goes against our beliefs to recommend fast dieting fixes. Therefore, when you receive our advice it will be what’s best for your long term health and fitness and continued success. For the most effective results we would always recommended the full consultation. If we have all this information we are able to approach your training programme far more efficiently and will give you the best opportunity for success. If you want the results and the benefits of One-2-One Personal Training, but at a more affordable cost, our Small Group Personal Training Programme is just for you. Sharing your Personal Training sessions with up to 3 others (4 persons per session) who are striving towards the same Fat Loss / Muscle Gain & Strength goals as yourself, there is no better environment to be in. Our SGPT sessions have a great atmosphere. The professional coaching of one of our great Trainers along with the encouragement from the others in your session, you’ll certainly get a buzz to push your boundaries and achieve amazing results. The sessions are based on circuit based high intensity but fun and functional movements aimed at achieving great Fat Loss results. The session plans and progressions that you follow in SGPT sessions are proven to get results, time and time again. Client will be weighed using specialist scales and will be given a detailed breakdown of their requirements regarding Carbohydrates, Fats and Proteins. In addition, the client will be advised as to their body fat percentage and BMI. In addition, the client will also be advised as to their macronutrient calculations. Please note: Clients will be required to attend two appointments. The initial appointment will last for approximately 0.5 hours, and then a further 1 hour will be required at the second appointment. This will include the following: Height / Weight / BMI / Body fat percentage / Visceral fat rating / Lung function / Blood pressure / Resting heart rate and also a cardiovascular and also a muscular endurance test that can be repeated at agreed point in the future to establish progress achieved.